The proportion of 11-year-olds offered a place at their first-choice secondary school in England is the lowest since 2010, official figures show. This year, 83.5% of applicants received offers from their first choice schools, down from 84.1% last year. The last time more than 16% of applicants were not offered their first choice was in 2010. However, the government says the system is "rising to the challenge" of providing more school places. And at primary level, there was an improvement in the proportion of children offered their first choice of school. This year, 90% of four-year-olds were offered their first choice, up from 88.4% last year. The figures show that overall 94.6% of 11-year-olds received an offer from one of their top three preferences for secondary school and 97.2% of four-year-olds were offered one of their top three preferences at primary school. "The vast majority of parents continue to secure a place at their first choice of school for their child," said a Department for Education spokeswoman. "The latest data shows that nearly 725,000 additional pupil places were created between May 2010 and May 2016," said the statement. A baby boom over the past decade resulted in a squeeze on primary places and this is now beginning to affect secondary schools. The figures show that 562,487 applications were made to secondary schools in England this year - the highest since 2008 when 568,723 applied. The figures also reveal large regional differences. In London, just 68.2% of children were offered their first choice secondary school compared with 98.2% in Northumberland. However, since 2013 the birth rate has slowed, meaning pressure on primary places is easing slightly. At primary level there were 620,330 applications, down 3.3% on last year's figure of 641,572. Again, regional variations showed parents in north-east England were most likely to secure their first choice of school for their child: 94.1%, compared with 85.9% in London. "There are already 1.8 million more children in good or outstanding schools than in 2010 but we want to do more to ensure every child has access to a good school place," said the DfE spokeswoman. 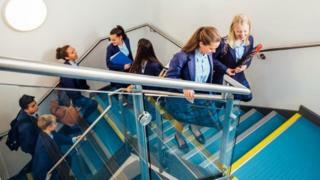 The Local Government Association said councils had created more than 600,000 primary places in recent years but did not have the same powers to create secondary places as most secondaries were academies, outside local authority control. Richard Watts, who chairs the LGA's Children and Young People Board, called for councils to be given powers to make academies expand. "Most academies will be keen to work with their local authorities, but in the minority of situations where this isn't the case appropriate powers are vital to ensure all children get a suitable place," he said. "Councils must also have the lead role in judging and approving applications for new free schools to make sure they're appropriate for communities, and will need to be able to place vulnerable children in the schools that can offer them the best support," said Mr Watts.